Presented the Los Angeles premiere of Touretteshero Presents Backstage in Biscuit Land. (Read the feature story on this performance in the L.A. Times.) Presented as a “relaxed performance”, this was new ground for the Skirball and a major step towards expanding accessibility and inclusion to all audiences. Exploring spontaneity, creativity, and disability, the two-woman solo show—devised and performed by theater artists Jess Thom and Jess Mabel Jones—weaves together comedy, puppetry, singing, and incredible tics. Thom has the neurological condition Tourette’s Syndrome, which prompts her to say “biscuit” 16,000 times a day and has given her a unique perspective on life. A hilarious, inspiring, and pioneering work, Backstage in Biscuit Land welcomes people of all shapes, sizes, and abilities to enjoy theater. The Skirball’s two-night run of Backstage in Biscuit Land coincided with National Tourette Syndrome Awareness Month, established to raise awareness of and reduce stigma associated with the neurological condition. Backstage in Biscuit Land—a runaway hit at the Edinburgh Fringe Festival, where the show premiered in 2014—is not only about Thom’s personal experiences living with Tourette’s but also, more broadly, about theater itself. Having once been excused from her ticketed seat in a theater and moved to a sound booth, Thom resolved to “look for the only seat in the house I knew I wouldn’t be asked to leave: the stage.” From this vantage point, Thom has sought to help redefine the theatergoing experience, inviting the audience to make noise and move around during the show. Because Thom is neurologically incapable of staying on script, no two shows are ever the same. Thom and Jones (who goes by “Chopin” on stage) use this unpredictability to their comedic advantage. 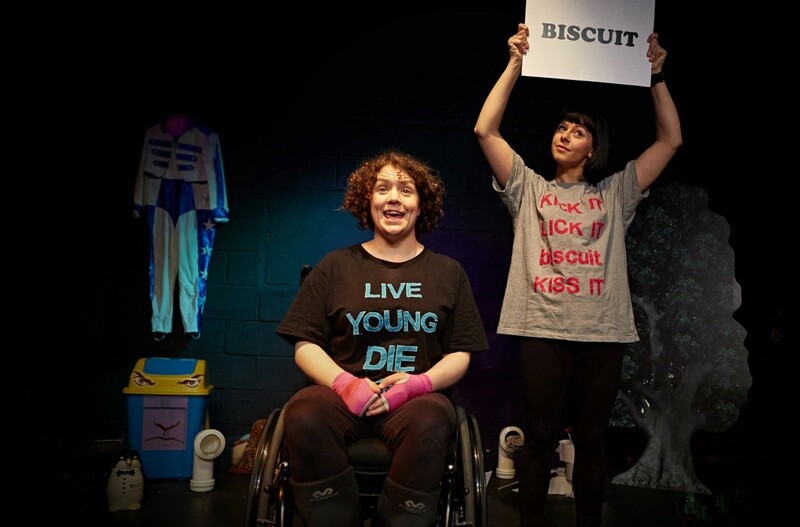 Surrounded by a slew of props, including a trash bin and a plastic circular saw, the two performers introduce the audience to Biscuit Land, where misconceptions about Tourette’s are dispelled and topics of conversation may or may not range from geraniums to penguins. As a result, performances are what Thom calls “extra live,” a term that emphasizes the creative benefits of her performance style and underscores her belief that “making theater more inclusive makes it better—for disabled people and nondisabled people” (American Theater). At the Skirball, performances were held in the Ahmanson Hall ballroom, rather than a traditional seated auditorium, and featured ASL interpretation to ensure accessibility by audience members of all abilities. Touretteshero is the multiplatform project cofounded by artist, performer, playworker, and fundraiser Jess Thom and her creative partner Matthew Pountney. Its aim is to celebrate and share the creativity and humor of Tourette’s in an accessible way, with the widest possible audience.